As many of our imports are made from cotton, I'm trying to educate myself more on the subject of cotton subsidies here in the US. Basically what I understand about farm subsidies in general is that the US government encourages large farms to produce too much of a particular product. These large producers have huge profits and end up "dumping" their excess product on the world market. Not only does this affect farmers abroad, but it also affects small farms here in the US too. According to a photo journal on the BBC, Burkina is the 2nd largest producer of cotton in Africa, after Egypt. This is astounding to me since I myself never really saw it when I lived in Burkina. But then again, it's grown primarily in the southern part of the country. One other interesting note is that the US is the largest exporter of cotton in the world. One organization that's doing a lot of work around the American subsidies is Oxfam. 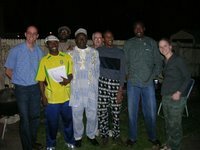 I first became aware of Oxfam's work with cotton subsidies during a concert by Malian singer Habib Koite in early 2005. Habib is an amazing artist and the Make Fair Trade signs around the Cedar Cultural Center definitely alerted me to the issue. Habib is actually coming back to Mpls next month for the tour Putumayo Presents: Acoustic Africa. Some of the proceeds from the album will be donated to the Make Fair Trade campaign as well. Ouedraogo is cotton producer from the village of Tabou in the Sissili Province of Burkina Faso. He farms a 10-acre cotton field for profit and a five-acre cereal field for subsistence farming. Ouedraogo is also the deputy secretary general of the National Union of Cotton Growers in Burkina (UNPC/B,) an organization created in 1998 to support the country’s cotton producers. 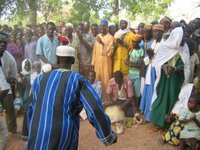 He is also the deputy secretary general of the Farmers’ Confederation of Burkina Faso (CPF), a national platform composed of all national professional organizations. Ouedraogo is married and has one daughter. We unfortanately were unable to attend his events since he was here the same weekend as the April St. Paul Art Crawl. 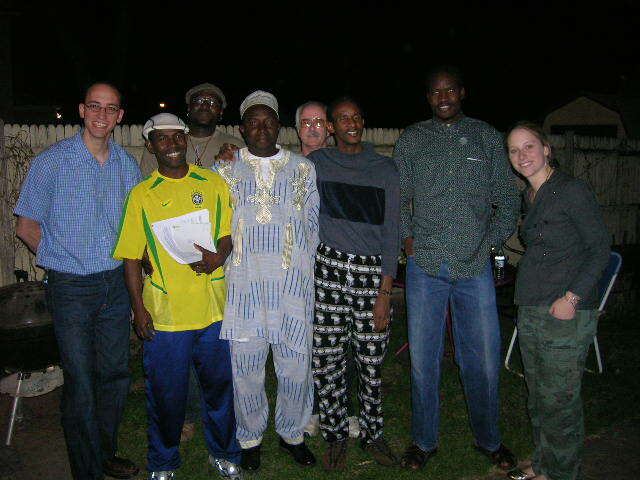 But we did have a BBQ for him on the eve of his return to Burkina. It was very exciting to have him to our place and to hear the lively conversations that ensued with our guests. Katie Danko (the Oxfam field organizer); RPCVs from Burkina, Lesotho, Kenya, DRC; friends from Mali, Burkina and Kenya; and others interested in the topic attended on that brisk spring evening. 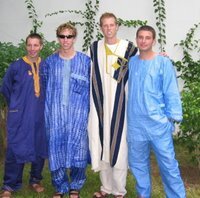 I find it interesting to compare clothing traditions in East Africa vs West Africa. I think second hand clothes are much more readily available in East Africa (I can only speak for Kenya and Uganda) and they are cheaper than having an outfit made. To a certain degree, this is also true in Burkina (that 2nd hand clothes are cheaper than having an outfit made) but outfits are always made for special occasions or holidays. You definitely find more 2nd hand clothes in the cities and more Western influence as well in peoples' dress. Looking into this crowd of rural folks, you don't see a ton of Western clothes. 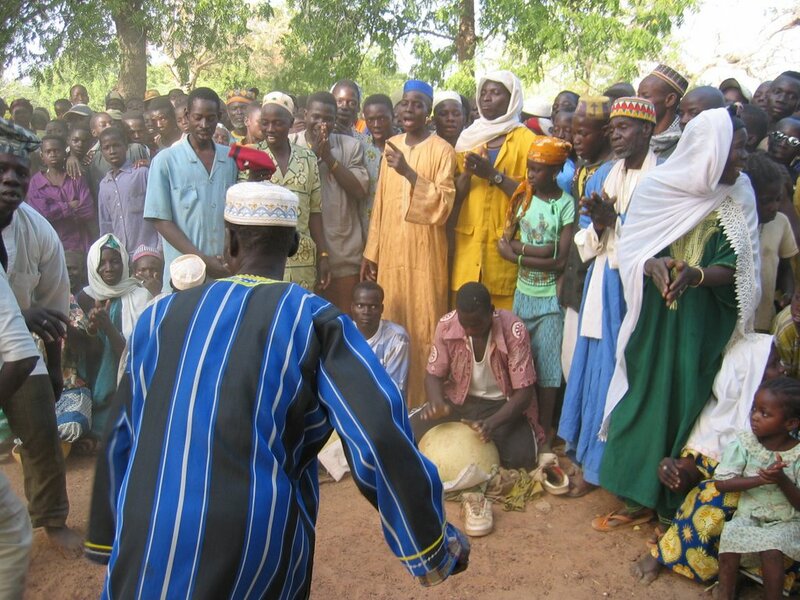 My hypothesis is since cotton is grown in Burkina, many Burkinabe still wear traditional clothes. The traditional dress for Mossi women is an indigo pagne (wrap skirt) which is often handwoven and dyed in their village. Men wear loose shirts with big pockets in the front. And then there is the boubou for both men and women as shown below. I think this picture of PCVs is a good example of the range in fabric types. You have wax fabric, Mauritanian fabric, Faso dan Fani, and wax again. Note the embroidery, which is found on both womens and mens wear. So, getting back to my original point of this posting, some of our imports are fabrics! We have gode, kente, mudcloth, wax, Mauritanian, indigo, etc etc. We have turned these raw pieces into shower curtains, window curtains, wall hangings, stool covers, bed spreads, pillows, rugs, etc etc. 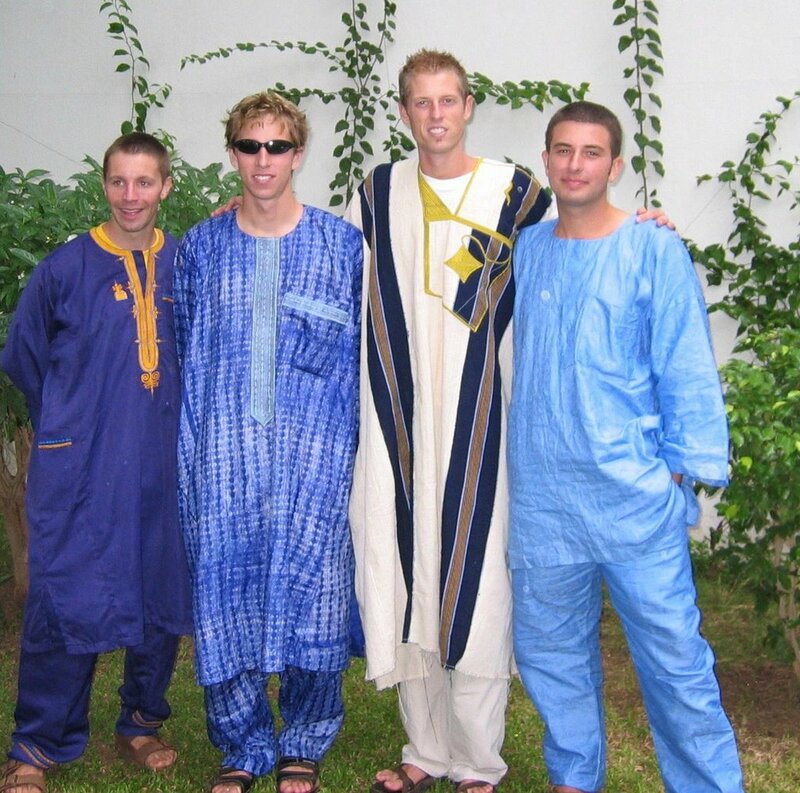 I think some Americans get freaked out by African fabrics because they just don't know what to do with it. There's a lot we can make with these products and we have to ensure that local Burkinabe farmers aren't put out of business. Hey Nancy and Rabi, you mention shower curtains - my old Burkina shower curtain is now just about all worn out - would you be able to provide a replacement for me? Mine was a wax pagne that I brought back from Burkina, but I think I'd like to try a mudcloth version. Let me know what you think of the possibilities. Thanks, -Denny FitzPatrick, RPCV Burkina Faso '67-'68.